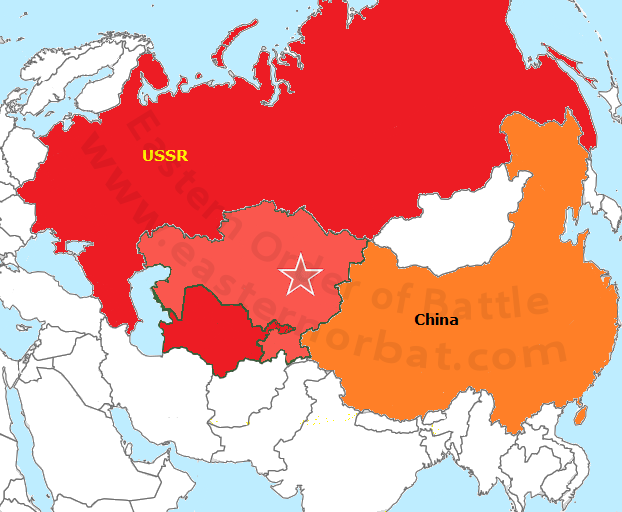 By the end of the sixties the Chinese-Soviet relations hit the bottom. In 1969 the Turkestan Military District was divided into two parts. The Central Asian Military District was formed on the territory of Kazakhstan, Tajikistan and Kyrgyzstan SSR. Its mission was to protect the Soviet-Chinese border. In 1984 the Turkestan Military District became the subordinate of the General Command - Southern Theatre. In 1989, after the war in Afghanistan, the Soviet Turkestan Military District and the Central Asian Military District has been merged again. MiG-27 Flogger armed with eighteen bombs in Soviet-Chinese border. 5th Training Center and the improvement of Aviation Personnel. Mig-23 Flogger conversion training school at Lugovoy. Part One.